This article is about real life association football managers. For the video game, see Football Manager. 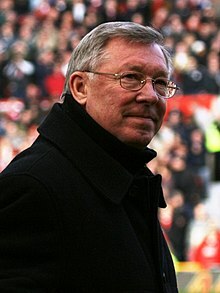 Alex Ferguson winner of the most English Manager of the Year awards, all won during his tenure as manager of Manchester United. As of 2015 he is the UEFA Coaching Ambassador. In association football, a manager is an occupation of head coach in the United Kingdom responsible for running a football club or a national team. Outside the British Isles and across most of Europe, a title of head coach or coach is predominant. Selecting the team of players for matches, and their formation. Planning the strategy, and instructing the players on the pitch. Motivating players before and during a match. Delegating duties to the first team coach and the coaching and medical staff. Scouting for young but talented players for eventual training in the youth academy or the reserves, and encouraging their development and improvement. Buying and selling players in the transfer market, including loans. Facing the media in pre-match and post-match interviews. Some of the above responsibilities are shared with the director of football or sporting director, and are at times delegated to an assistant manager or club coach. Marketing the club, most especially for ticket admission, sponsorship and merchandising. Growing turnover and keeping the club profitable. These responsibilities are more common among managers of small clubs. The title of manager is almost exclusively used in British football. In the majority of European countries where professional football is played, the person responsible for the direction of a team is awarded the position of coach or "trainer". For instance, despite the general equivalence in responsibilities, Bobby Robson was referred to as the manager of England, while Joachim Löw was described as the head coach of Germany (Germany also has a team manager role that is subordinate to the head coach and that is filled by Oliver Bierhoff). The responsibilities of a European football manager or head coach tend to be divided up in North American professional sports, where the teams usually have a separate general manager and head coach (known as a field manager in baseball), although occasionally a person may fill both these roles. While the first team coach in football is usually an assistant to the manager who actually holds the real power, the American-style general manager and head coach have clearly distinct areas of responsibilities. For example, a typical European football manager would have the final say on in-game decisions (including player line-ups), and off-the-field and roster management decisions (including contract negotiations). In American sports, these duties would be handled separately by the head coach and general manager, respectively. ^ "Manager or Coach?". Football Italia. 5 September 2008. Retrieved 30 January 2011. This page was last edited on 11 April 2019, at 17:40 (UTC).